A Splendid Messy Life: Celebrating Community as A Splendid Messy Life Turns 2! Celebrating Community as A Splendid Messy Life Turns 2! When I started this blog two years ago, I didn't really know what to expect. I figured a few close friends would follow along, and it would give me a venue to share the ups and downs of motherhood without flooding my personal Facebook feed. I have been, and continue to be, blown away by the support and encouragement so many of you show here. If there's one thing I know for sure about being a mother it's that it can be lonely, and it's important to find your "tribe". The group of people with whom you belong. Whether you are a regular commentator or a silent reader of my blog, I appreciate you, and I am so grateful you are here. I'm glad we're in this little faction/district/tribe together. In the spirit of community, I have a special giveaway to celebrate A Splendid Messy Life's second birthday. I've put together 2 huge stationery bundles to be won. 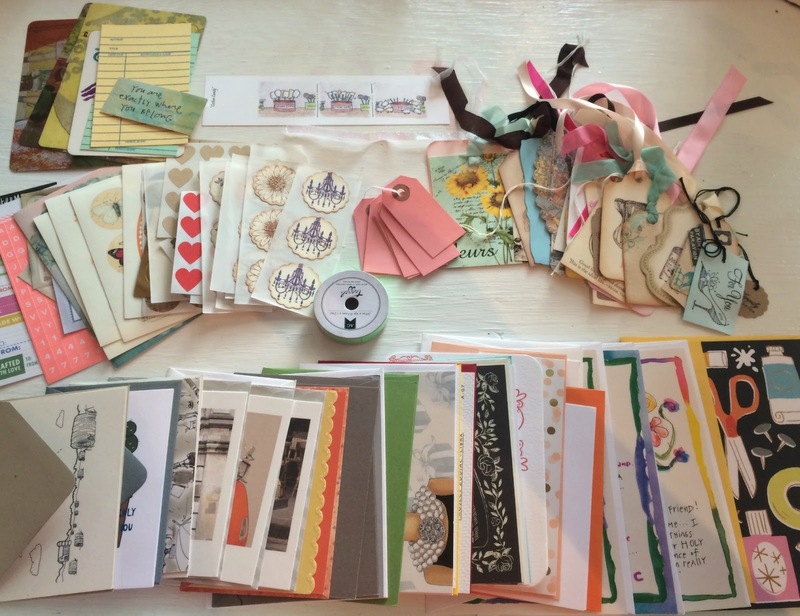 Each kit includes over 25 cards, 20 gift tags, 150 stickers as well as postcards, glitter tape, a bookmark, and other fun paper goodies. There are cards and stickers from Etsy, A Beautiful Mess, Kate Spade, Chapters Indigo, Papyrus, Cavallini & Co, and SARK. To enter just leave me a comment below or over on the Facebook post linking to this page. Winner will be selected at random on Sunday, October 18th. This contest is open internationally, although, if I don't hear back from you a day or two after you've won, I'll need to choose another winner. This is a photo of most of Kit 1. The 2 kits are similar, but some of the exact cards/stickers/tags are different. I encourage you to celebrate community by sending some snail mail to the important people in your life. Fall is the best season for things that feel comfy and good, and that's really what connecting with others is all about.